Though topographically spectacular, with the High Tatras part of its territory, Presov has the weakest economy in the country, with less than half its population living in the cities. The region is still rural, and despite its economic shortcomings, the friendly locals give the area a homey vibe. The main recreational activities in the region are skiing on the mountain slopes during the winter season and hiking up the trails in the summer. More sedate attractions are the tours of the Spiš and Strazky Castles, the Cervený Klástor Monastery, the Hraničné and Potoky wooden churches, and the Bardejov historic centre. 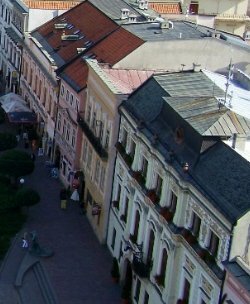 Presov City is one of Slovakia’s largest cities. Many of its old buildings have been well-preserved, their Gothic, Baroque and Renaissance features defining the city. The cobblestoned city centre is elliptical in shape, bordered by old fortifications and monuments. An interesting thing to look out for here is the metal line that runs through the centre of the town, marking the 49th parallel. There are several reasonably priced hotels, chalets, and rooms in residences available in Presov. The cuisine is mostly limited to local and European fare, as American fast food chains and shopping malls have not yet made it this far into the country.